St. Joseph Health System wanted to add campaign specific banners to all outgoing email addresses. This required a solution that would allow marketing to easily update all employees’ email signatures, while allowing them to retain complete control over the process. Exclaimer Signature Manager Exchange Edition was utilized in order to give marketing the freedom to design email signature templates without having to get the IT department to implement a costly and time consuming solution. St. Joseph Health System is the main healthcare provider in ten counties making up the Brazos Valley of central Texas. Starting as a small 35-bed hospital in 1936, the organization has now grown to 611 licensed beds in seven locations. As the largest provider of healthcare in the region, St. Joseph Health System is renowned for being a leader in critical care, open 24 hours a day and with state-of-the-art equipment for complete management of the most difficult emergencies. As a Catholic healthcare organization, St. Joseph Health System is challenged to provide quality care and respond to the needs of their community. Email is one of the main marketing tools used by the organization, so it was decided to add campaign banners to all employee signatures in order to increase awareness of upcoming local events and initiatives. However, with a database of thousands of contacts, the complexity of enabling this plan soon became apparent. Time consuming and resource intensive, it was clear that a dedicated software solution was required to give marketing direct control over any signature content, allowing them to automatically add new banners as and when they were required. A number of different products were researched and assessed on a combination of functionality and price. In the end, Exclaimer Signature Manager Exchange Edition was chosen due to the software’s unique ability to address the challenges they were facing. Even with all the IT resource that the organization had available, implementing other signature solutions would have meant a large labour cost and would have been too costly. Also, with marketing not being allowed access to crucial systems like the Exchange server, a tiny change to email signatures would have been an enormous undertaking from an IT perspective. As mail admin, I needed to find a product that was quick to install, didn’t require a system restart, was easy to configure and simple to operate. By all accounts, Signature Manager Exchange Edition met these requirements. Exclaimer Signature Manager provides an intuitive editor that enables the marketing department to design and test email templates prior to them being sent. 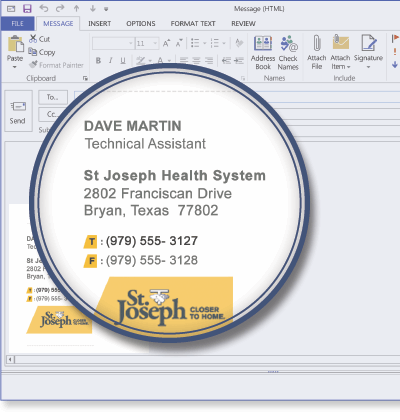 The software offered St Joseph Health System the ability to configure specific mail format disclaimers, marketing messages and the design of each email for Outlook and mobile devices using OWA. The organization also were given the ability to see the added communication banner, legal disclaimer, signature and marketing message after it was sent, which is not a function offered when sending through Exchange. All users would now have visual confirmation of the processed email within their Sent Items each time. “The Exclaimer Technical Support had a good, clear and concise solution for every question I asked,” explains Wayne Norman, Email Systems Specialist at St. Joseph Regional Health Center, the main campus of the organization, as he purchased the software. “Their product support site also had additional content that I knew I would need in the future with relevant screenshots included.” Expecting to take half a day to teach the marketing department how to use the software, IT handed over everything in less than an hour, safe in the knowledge that no further IT work was required. After implemention of Signature Manager, the day-to-day running of the software is now the responsibility of the marketing department. The software eliminated the manual labour cost that would have occurred if IT had been involved and simplified the design process so that all employees would be guaranteed to be using the right email signature. Productivity rates increased dramatically once Signature Manager was deployed. What would have required significant manual effort—pulling data from multiple databases, adding banners to each email, asking IT to implement new campaign banners for all employees—has been automated, producing significant time-savings that were not expected at the time. This allows marketing to focus solely on the creative aspects of their campaigns.